Black Mountain's "Monster Mercs" were hired by Praetor and Geb, whose corporate headquarters are in Loveland, OH. It seems that a sculpture that Horatio Geb had made was stolen from their offices late one evening in April 2014 by what video showed to be seven frog men. 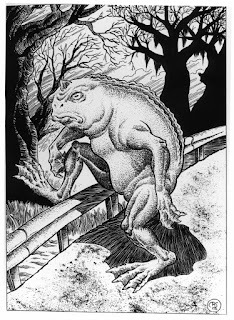 The frog men had been sighted in the area since the 1950's, but had never been linked to any crimes in the area. What Project: Abyss discovered in an underwater lairs was an army of close to 50 frog men who were cavorting and croaking around the idol. Eden Good was able to establish communication and learned that Horatio Geb had spent many hours among the frog men and had sculpted their god, Tsathoggua, before his death. Tsathoggua had demanded that the sculpture be taken so that it could immortalize Geb. It was at that point that Dr. King discovered a "pod" that seemed to be pulsing at roughly the rate of a standard human heartbeat and gave the order to exterminate the army, burn the pod, and destroy the sculpture. For good measure the team even used shaped charges to destroy the underwater lair. However, sightings of the frog men continue to this day.